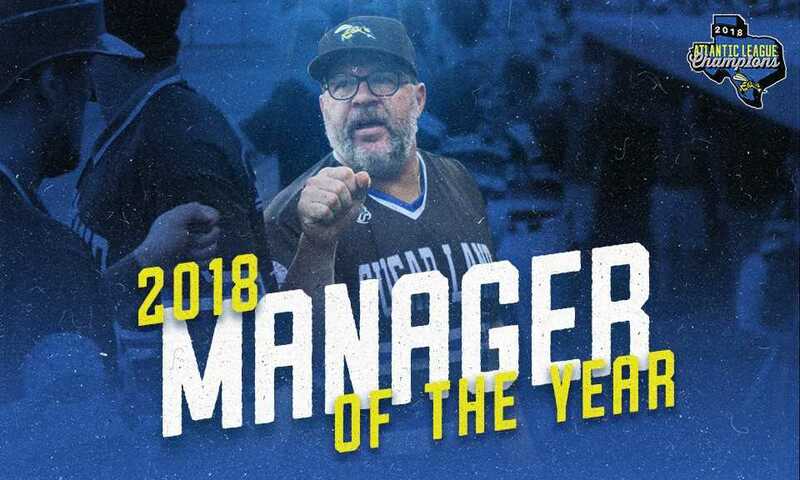 SUGAR LAND, TX— The Atlantic League of Professional Baseball today announced that Sugar Land Skeeters manager Pete Incaviglia was named the 2018 Atlantic League Manager of the Year. It marks the second time a Skeeters manager has taken home the award in the franchise’s seven-year history, with Gary Gaetti winning it in 2013. Incaviglia, in his first season as the Skeeters manager, led the team to its second-ever Atlantic League Championship and its second in the last three seasons. The Skeeters compiled an 81-45 regular-season record, which were the second-most regular-season wins in team history and was the second-best winning percentage in team history. Fourteen players from the Skeeters’ 2018 roster had their contract purchased by an outside professional baseball organization, including 12 with their contracts purchased by Major League Baseball organizations. The 14 contracts purchased, along with the 12 contracts purchased from MLB organizations, were both franchise single-season records. Since the Skeeters joined the Atlantic League in 2012, only the Somerset Patriots had more contracts purchased by MLB organizations in a single season (13, 2017). Thirty players with Major League service time appeared with the Skeeters in 2018, which was also a franchise single-season record. Under Incaviglia, the Skeeters accumulated 52 home wins, surpassing the record of 50 home wins in 2013. The Skeeters also set team single-season records in batting average (.273), on-base percentage (.349) and ERA (3.11). Left-hander James Russell became the first player in team history to win the Atlantic League ERA title (2.36) and Matt Chavez’s .320 batting average was the highest single-season qualifying batting average in team history. The 2018 Atlantic League Championship was the second league title that Incaviglia has been involved with throughout his illustrious career. He was a member of the 2000 Nashua Pride, which also went on to win to the Atlantic League title. Incaviglia was in his first season managing the Atlantic League but he also managed the Laredo Lemurs to an American Association Championship in 2015. Incaviglia began his managerial career in 2008 with the Grand Prairie AirHogs of the American Association and owned eight seasons of managerial experience in the American Association prior to joining the Skeeters in 2018. Dating back to his stint in the American Association, Incaviglia has led his teams to the playoffs in three of his last four seasons, including two trips to the semi-finals. He owns a 506-405 career record as a manager at the independent level and has only finished a regular season with a losing record on one occasion. Incaviglia played 12 seasons in the Majors after being selected by the Montreal Expos with the eighth overall pick of the 1985 MLB Draft. He still owns NCAA Division I records for single-season home runs (48), RBIs (143) and slugging percentage (1.140) from his time at Oklahoma State. He also still owns the NCAA Division 1 career home run record (100). Incaviglia was named college baseball’s Player of the Century by Baseball America in 2009.